'Paveway bombs have been fired' Jump to media player Four Tornado jets have taken off from RAF Akrotiri, Cyprus, but the Ministry of Defence has not confirmed where they were going. Benn: 'IS hold our democracy in contempt' Jump to media player Hilary Benn was applauded by MPs as he urged Labour members to confront the "evil" posed by Islamic State, who he said "hold our democracy in contempt". Who are Syria's moderate rebels? Jump to media player Ghadi Sary takes a look at David Cameron's claim that there are 70,000 moderate opposition fighters in Syria, ready to co-ordinate with the UK against so-called Islamic State. Benn's Syria speech applauded by MPs Jump to media player Shadow foreign secretary Hilary Benn is applauded by MPs as he finishes his speech calling for air strikes in Syria against so-called Islamic State. 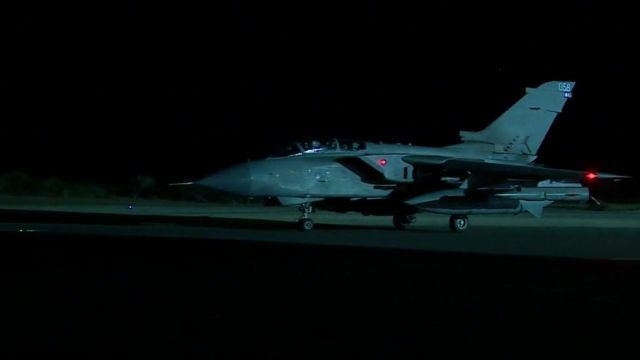 Four Tornado jets have taken off from RAF Akrotiri, Cyprus, the first to do so since MPs voted for UK air strikes against so-called Islamic State in Syria. The Ministry of Defence has not confirmed where they were going. A further four fighter jets are on standby at the air base, which is used to launch bombing missions to Iraq. The BBC's Jonathan Beale was at the runway in Akrotiri as the first pair of Tornados landed.